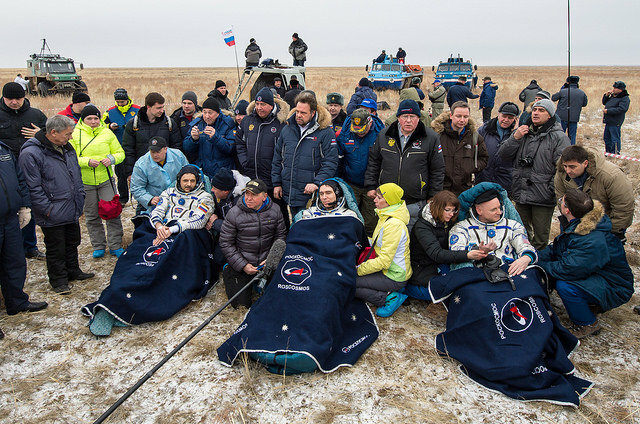 A few hours ago, the cosmonauts Sergey Volkov and Mikhail Kornienko and the American astronaut Scott Kelly returned to Earth on the Soyuz TMA-18M spacecraft, landed without problems in Kazakhstan. Volkov spent about six months on the International Space Station, where he arrived on September 4, 2015 as part of Expedition 45. Kornienko and Kelly spent 340 days on the Station, where they arrived on March 28, 2015 as part of Expedition 43. During the period spent on the International Space Station, the three crew members have been conducting various maintenance activities and many scientific experiments. From this point of view, Scott Kelly and Mikhail Kornienko were the busiest because it was the last part of their one-year mission, a frontier from the physical and psychological point of view. During the Expedition 46 period there was the arrival of the Russian Progress MS-1 space cargo ship on December 23, 2015. The American Cygnus space cargo ship left the Station on February 19, 2016. On February 3, 2016 Sergey Volkov conducted a spacewalk along with his colleague Yuri Malenchenko for various maintenance activities to the Russian segment of the International Space Station. In the end, however, the importance of this moment is mainly due to the fact that it marks the end of the one-year mission. NASA astronaut Scott Kelly and Russian cosmonaut Mikhail Kornienko spent 340 consecutive days in space. The two of them started it with Expedition 43 and spent on the International Space Station a period twice as long as a normal mission, facing new challenges from the biomedical and psychological point of view. The one-year mission isn’t really over because the two protagonists will keep on being the subjects of exams. The consequences of such a long time spent in a microgravity environment need to be understood also from the point of view of their return to Earth. Humans who return from a six-month mission require some time to get used to the normal gravity again, how long will it take to Kelly and Kornienko? In Scott Kelly’s case, the tests carried out simultaneously with his twin brother will continue as well. It’s a truly unique opportunity to have not theoretical but real reference biomedical measurements. They’ll help even more to find new ways to maintain astronauts’ health during long missions in space, in the future also to Mars. As always, these studies will also contribute to medical research useful for human beings in general, beginning with those on osteoporosis. Monday 29 February, Scott Kelly officially handed over the command of the International Space Station to the American astronaut Tim Kopra, marking the beginning of Expedition 47. The crew will be completed with the arrival of new members scheduled for March 19.